Struggling for time? Why not watch a fast forward version of this tutorial by skipping to the final lesson. In the Lesson Raewyn starts us off nice and easy by showing us the simple and clever trick she uses to make the dragonfly’s wings – very simple and effective. Another easy-to-follow lesson as Raewyn shows us how to prepare the plaque and along the way gives some helpful tips on nifty ways to use everyday cake utensils. We strongly suggest that you have something to eat before watching this….seriously. In this lesson Reawyn shows us how to tactfully stack the double barrel cake with plenty of support and a good solid foundation. Of course she does this using ganache, the tastiest glue known to man, but there’s more to it than that. Stay tuned to find out. We learn how to get a perfectly flat lid for the top of the cake. For those of you who are not used to ganache, Raewyn shows us how to get beautifully neat edges. One more layer and the cake is then ready for the sugarpaste. This is where things get very neat, with impressively sharp edges. In this lesson, Raewyn also shares with us some great ganache tips and ways of getting ourselves out of stressful situations. Time to get artistic! Pencils and paint brushes at the ready. This is a very therapeutic part of the tutorial and don’t worry if drawing and painting isn’t one of your strengths. Raewyn has been very clever and created a stencil outline for us to follow and you will love how she gets that stain glass effect. If you missed the template in the Tools tab above, download it here. Don’t worry if you’re not experienced with piping because Raewyn demonstrates a nice and easy way of piping. Get some music on, relax and allow your mind to wander just as long as your hands don’t! The cake is then covered in white sugarpaste. This can be a really tricky shape and size to ice but Raewyn has a few tricks up her sleeve that might just save you hours of pain. After that last lesson you will be a pro! This lesson covers a slightly different way of covering the cake and maintaining all those lovely, sharp edges. 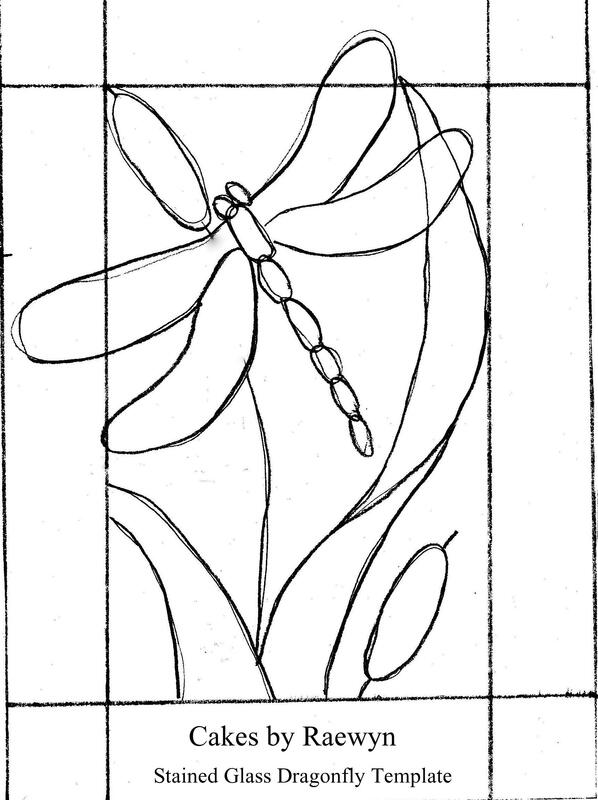 Now it’s onto the dragonfly. You’ll be shocked at how simple Raewyn makes this – it takes great skill and creativity to use the simplest of methods to get a great effect and just wait till you see how it all turns out. This is where it all really starts taking shape. 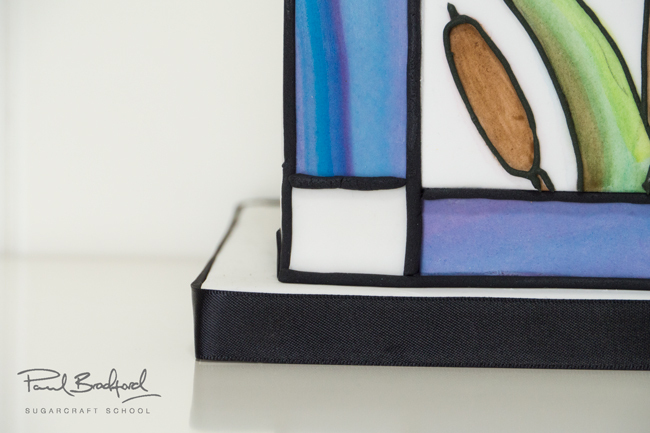 In this lesson, Raewyn shows us how to get a beautiful stained glass effect using only… well, you’ll have to watch to find out, and no, it’s not paint! 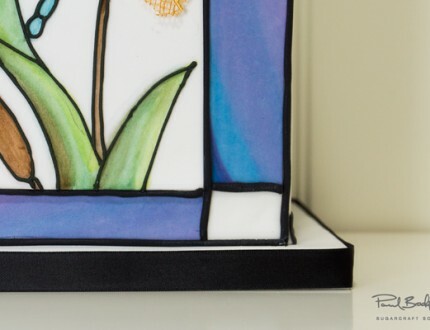 Raewyn now adds borders around the stained glass frame which really finishes it off well. Watch and see what clever gadget she uses to save her having to roll out numerous thin pieces of sugarpaste. We’re almost there! Just a few little steps and it’s all complete. 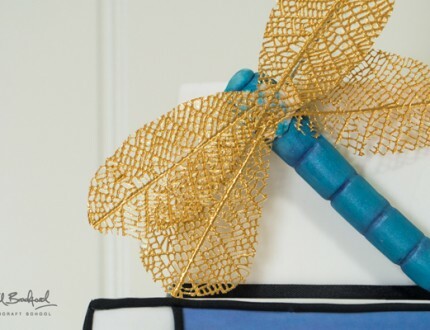 In this lesson, Raewyn has added ribbons off camera and now shows us the process for getting the cake finished off by attaching the dragonfly body and then the wings for both dragonflies. 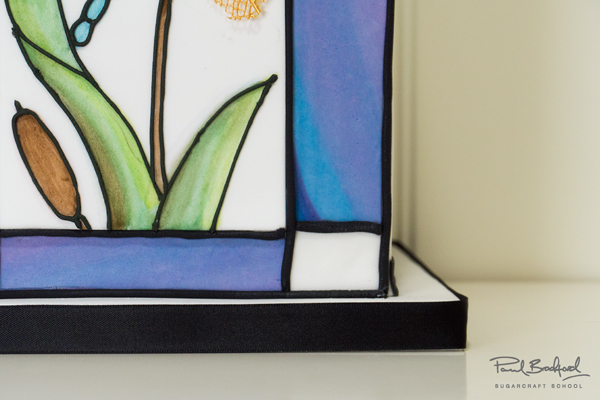 In this lesson, Paul and Raewyn take us through the costs of making and selling this cake – essential viewing for the professional cake decorator! Paul and Raewyn suggest some other ideas that you could use when making this cake. Hopefully it will whet your appetite and get your creative juices flowing. 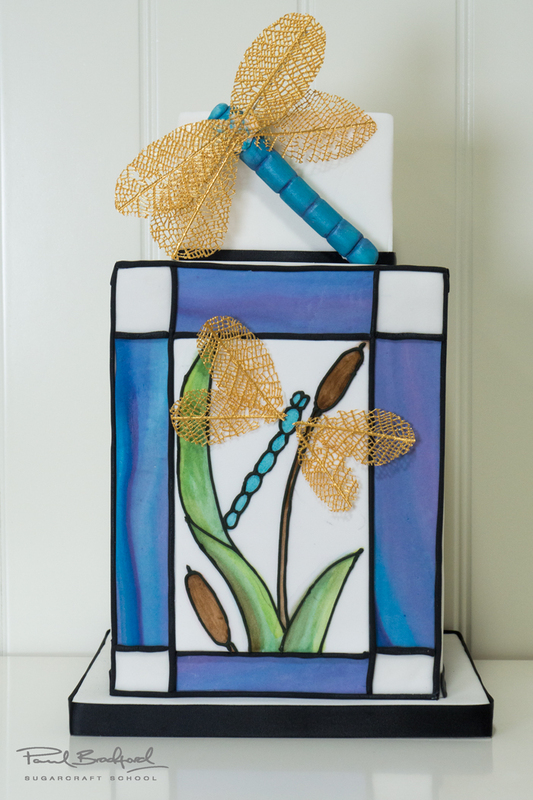 We would love to see your take on the Stained Glass Dragonfly Cake – please share your photos with us on our Facebook Page and Raewyn’s! This is the place to be if you want to quickly see how it is all put together – 1 hour and 45 minutes shortened to just 10 minutes! 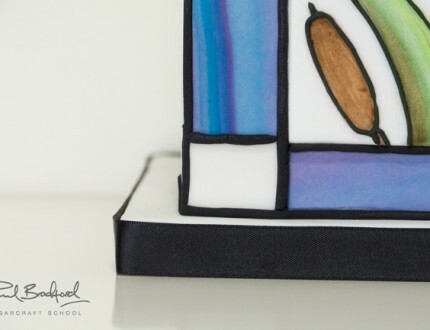 The wonderful Raewyn Read gives us the low down on her beautiful Stained Glass Dragonfly Cake that combines many different creative skills including how to make very sharp edges, creating the delicate dragonfly wings and painting the stained glass. 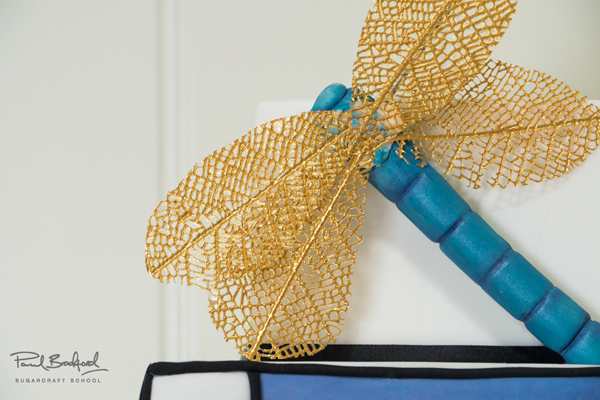 After watching this course you will have a new set of skills and a whole host of ideas for your new cake designs. Not only does it look very impressive but it is a big feeder! 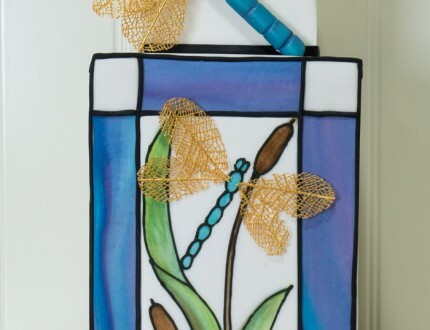 This cake will take one day to create and is suitable for cake decorators of all skills levels. We would love to see your take on the Pug Dog Cake – please share your photos with us on our Facebook Page and Raewyn's! 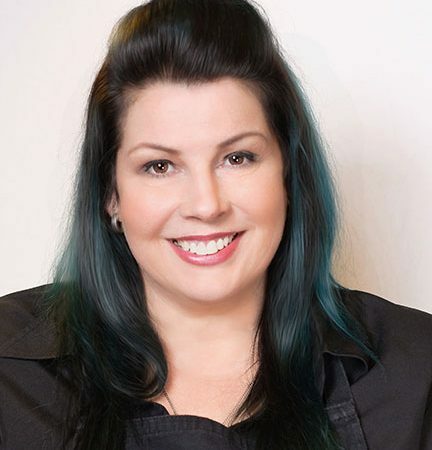 Raewyn Read is an award-winning, international cake decorator and instructor who discovered her passion for cake decorating when she made her youngest daughter's first birthday cake, utilizing the strong base of art and design knowledge she had honed through many years of creative pursuits. She is able to create using a variety of mediums but is mostly known for her figure modelling and original design concepts which have lead to her participating in numerous collaborations, including the award-winning Starry Night collaboration, and teaching cake decorating classes all across America, the United Kingdom, New Zealand and Australia, including her own studio in Sydney.